During David’s last visit to Portland, he discovered the wonder that is Pok Pok, an amazingly tasty Thai restaurant he learned about from watching Anthony Bourdain. 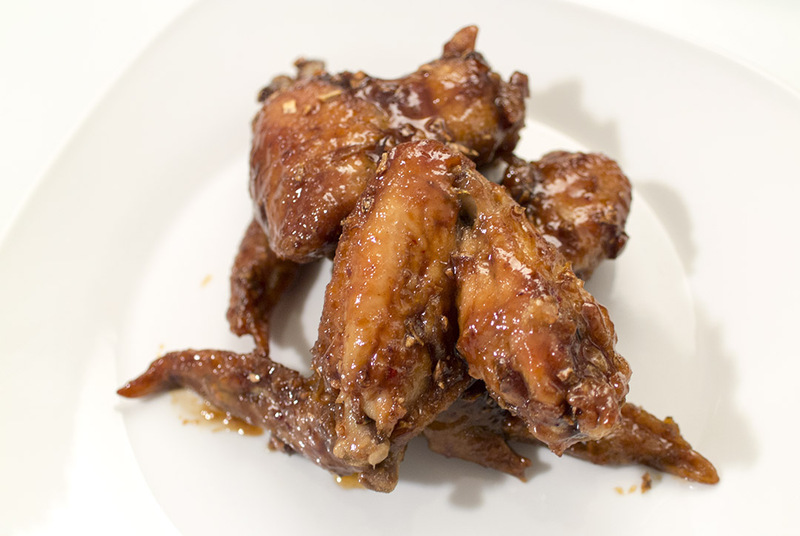 In particular, he raved about the fish sauce wings–that they were deliciously spicy with decadently chewy skin. His brother had a copy of Pok Pok’s recipe book, so we quickly grabbed our own copy to try a few things out. Very finely chop the garlic, sprinkle on the salt, then chop the two together for 15 seconds or so. Scrape the mixture into small bowl, add the ¼ cup of warm water, and let it sit for a few minutes. Set a fine-mesh strainer over another bowl, pour the garlic mixture into the strainer (or squeeze mixture in cheesecloth over the bowl), and use the back of a spoon to stir and smooth garlic to extract as much liquid as you can. Reserve the garlic. Add the fish sauce and sugar to the bowl and stir until the sugar has fully dissolved. You should have 1 cup of liquid. Put chicken wings in a large mixing bowl, add ½ cup of the fish sauce mixture, reserving the rest, and toss well with your hands. Cover and refrigerate at least 4 hours, or as long as overnight, tossing every hour or so. Pour enough oil into a small pan to reach a depth of about ¾” and set it over high heat until it shimmers. Set a fine-mesh strainer over a heatproof bowl. Test whether oil is hot enough by adding a piece of garlic (it should bubble right away). Add the rest. Decrease heat to medium-low, and stir once or twice. Cook garlic just until evenly light golden brown, about 5 minutes. Strain the garlic, reserve the flavorful oil for another purpose. Gently shake strainer, then transfer garlic to paper towels to drain and cool. Can be kept at room temperature in an air tight container for a day or two. Transfer the wings to a colander in the sink, shaking occasionally, to drain well, at least 15 minutes. Pour enough oil into a wok, Dutch oven or aid spot, to reach a depth that will completely submerge the wings, about 2″. Set pot over medium-high heat, bring the oil to 350 F, carefully stirring the oil to maintain a consistent temperature. In a large mixing bowl, stir together the rice flour and tempura batter. Fry the wings in 2 batches. Toss half the wings in the flour mixture and coat them well, knocking them to shed excess flour. Add first batch to oil and cook, prodding after 4 minutes and then every few minutes, until they’re evenly deep golden brown and completely cooked through, 6 to 8 minutes. Transfer to paper towels to drain. Do the same with the next batch. Add ¼ cup water to remaining fish sauce mixture, stir well, and set aside. Work in 2 batches to finish the wings. Combine ¼ cup of fish sauce mixture and half of the chili paste in a nonstick wok, set it over high heat, and bring to a boil. Cook until the mixture has reduced by about half, about 45 seconds. Add half the chicken wings, using tongs, toss the wings until the liquid has become a sticky, caramel-coloured glaze that coats the wings, about 1 minute. Add 1 tbsp of the reserved fried garlic, toss well and keep cooking, until the glaze has turned a shade or two darker, about 30 seconds more. Rinse and wipe out the wok and repeat with the second batch. In addition to being labour intensive they were also super tasty! They had a nice garlicky, savoury flavour. D noted that they were not as spicy as he’d hoped–this likely stems from the naam phrik phao (the recipe book suggests making it from scratch, which may be spicier than the store-bought kind), so next time we could either add more naam phrik phao (double it at least) or make it ourselves. In glazing the wings, D found that if the pan was too hot when adding in the fish sauce mixture, it boiled off too quickly and the wings didn’t acquire their colour as well. Definitely a recipe to keep working on!